The fit between the ever-detailed, maniacally disciplined, and flat-lined Greg Schiano, and the young and talented Buccaneers couldn’t be more perfect. As Greg Schiano sits at a wrought iron patio table overlooking the practice fields behind One Buc Place in Tampa, he is remarkably relaxed. No, he is as in control of things with the Buccaneers as he ever was in Piscataway, N.J.
That’s likely because the fit between the ever-detailed, maniacally disciplined, and flat-lined Schiano, and the young and talented Buccaneers couldn’t be more perfect. And that’s probably why Schiano, after several flirtations with the NFL, finally took the leap with this job and at this time. “I thought as I learned about this organization, it was the right fit,” Schiano said. “But it’s not why I went down the road initially. I do, however, think that’s what kept me going down the road. Under ex-coach Raheem Morris, the Bucs were a mess last season, going 4-12 and losing their final 10 games, often by lopsided scores. They were undisciplined and lacked focus. That’s why Schiano’s entrance should provide a big Year 1 bounce. A tighter ship should produce better results — and already has in the minds of players. “His focus and his vision is just different,” said defensive tackle Gerald McCoy, the third overall pick in 2010. “The way he locks into things and his attention to detail, and he doesn’t let anybody . . . there’s a straight line, and if you’re not on it, you’re going to make sure you get back on it. “And nobody, don’t matter who you are, he’s not going to let you get off that line. And if you’re not on the line, you’re going to have issues. Whether Schiano can sustain success after the initial post-hiring bump will be interesting to watch. Most coaches coming from the college ranks have struggled to enjoy success in the NFL, though Jim Harbaugh provided hope with a 13-3 record last season with the 49ers after jumping from Stanford. But Schiano was a three-year NFL assistant with the Bears under mentor Dave Wannstedt from 1996-98. And he has two consiglieres in former Browns coach Butch Davis and well-respected veteran offensive assistant Jimmy Raye to help him navigate the weeds. His coaching staff is an interesting mix of coordinators — Bill Sheridan (defense), MikeSullivan (offense), Bob Ligashesky (special teams) — a few positional coaches from the pro ranks, and nine assistants who are coming straight from college. What will ultimately decide whether Schiano is a long-term NFL success is disproving some of his weaknesses that showed at Rutgers. Schiano is a conservative game coach who believes running the football, defense, and special teams are the backbone of the team. That did not work for Dave “It’s not a sin to punt” Wannstedt with the Dolphins — and that was almost a decade ago. Can smash-mouth football win big in today’s offense-first NFL? “I think you can, but I think offense is very important as well,” Schiano said. “What I want to do on offense, I think we have a deep-shot quarterback [Josh Freeman]. We have to make sure we take those shots. Will Schiano, who tightened the reins offensively at Rutgers, be afraid of getting into shootouts (something Wannstedt avoided like the plague), which very well might happen with teams such as the Saints and Panthers in the NFC South? “If I think if we have the people, I’m not,” Schiano said. “When we had [Mike] Teel, Ray Rice, and Kenny [Britt] and [Tiquan Underwood at Rutgers], we had a 3,000-yard quarterback and 2,000-yard running back and two 1,000-yard receivers, we pushed the ball down the field. We really believed in doing that. After that, I don’t really know if we had the personnel to do it, you know what I mean? The biggest thing Schiano will have to prove is that he can win the do-or-die games. He did a tremendous job getting downtrodden Rutgers even to respectability, and that’s coming from an alumnus. But after posting the history-making upset over No. 3 Louisville in 2006, Rutgers failed to achieve the only thing missing on Schiano’s résumé: a Big East championship and a BCS berth in a conference that was struggling. 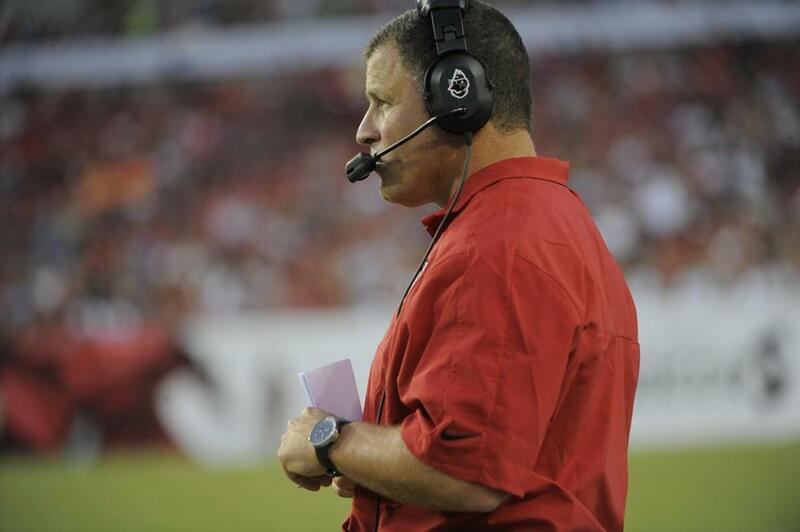 Schiano believes he’ll push through with the Bucs, because there are no disadvantages from team to team in the NFL. As expected, neither Medway native Pete Carmichael nor Steve Spagnuolo of Grafton got the interim head coaching job for the Saints. Sean Payton is suspended for the season and interim coach Joe Vitt is suspended for the first six games for their roles in the bounty scandal. Offensive line coach Aaron Kromer is directing the team in the final two exhibition games, and into the regular season. Former Saints guard Carl Nicks, who signed a five-year, $47.5 million contract in the offseason with the Buccaneers, said Kromer was the logical choice. “Man, I’m excited,” Nicks said of his former position coach. “I think he had an opportunity to interview for a head coaching job last year [with the Rams] and he didn’t get it, but I think he’s ready. He’s put in the time, he’s been around. “They have great coaches out there, they’ve got a system in place. The guy who holds the [yardage] sticks could run that organization because everything is going to be run no matter who’s in charge. Naming Kromer the interim coach was smart because it allow coordinators Carmichael and Spagnuolo to stay in charge of the offense and defense. Will Kromer adapt well to managing the game, which will be the most closely watched part of his duties? Nicks does not feel bad that Carmichael didn’t get the job. Thanks to team president Jonathan Kraft’s appearance on the team’s pregame radio show on 98.5 The SportsHub, we know the Patriots’ thinking on releasing Jonathan Fanene: that the defensive tackle wasn’t forthcoming about the arthritis in his left knee. There really was no other reason for the Patriots to cut Fanene unless they are coming after at least the $1.35 million they haven’t paid him yet. But why not go after all of it if you think you have a case? Kraft basically said Fanene lied on his entrance questionnaire when he signed with the team. That could be a tough sell because the Patriots received all of Fanene’s medicals from the Bengals. It would be tough to imagine there was information in there detailing knee problems, because if there were, wouldn’t the Patriots have tried to revoke the signing then, or at least been hyper-vigilant about said knee during his time with the Patriots and, especially, at his camp physical? 1. The in-season injured reserve rule and the trade deadline will not be changed for this season. Despite being approved by league owners, the changes weren’t signed off on by the NFLPA after the NFL wanted modifications to the padded practice rules included. This isn’t Congress. You can’t stick some pork in the bill. Good on the union. Those practice rules were bargained for. 2. Eagles receiver DeSean Jackson said on Twitter that the media were twisting his words when he told ESPN, “I was trying to protect myself from getting hurt,” while waiting on a new contract. Yeah, well, we didn’t make it up that you got benched against the Patriots when you short-armed two passes. But now you’re really fighting. OK, good. 3. Not sure how the Seahawks can avoid starting Russell Wilson at quarterback. The third-round pick seems to have won the job, even though that would put $26 million Matt Flynn on the bench. 4. Andy Reid should not have allowed his agent to talk about how Reid should get a new contract six days after the death of Reid’s son. Don’t care how or why it happened. It just shouldn’t happen. 5. The Patriots must be licking their chops for the season to start. They’ll face Locker of the Titans in Week 1 and likely John Skelton in Week 2 with the Cardinals. Against Tom Brady. Yeah, I like New England’s chances of being 2-0 heading to Baltimore, which will likely be the toughest game of the season considering it’s on the road. Not that he’s not giving it his all right now, but you have to think Devin McCourty will have a little bit more giddy-up in his step on the comeback trail after watching twin brother Jason, taken in the sixth round in 2009, sign a $43 million extension with the Titans . . . The Jets finally benched right tackle Wayne Hunter. Too bad they don’t have anybody better on the roster. UMass grad Vlad Ducasse was supposed to be the guy, but the Jets just don’t trust the 2010 second-round pick enough to put him on the field. He was kicked inside to left guard this year and lost out quickly to Matt Slauson, who is average . . . ESPN’s John Clayton made an interesting observation: Broncos quarterback Peyton Manning is back to normal throwing to his left, but after the neck surgery, he doesn’t seem as comfortable throwing to the right . . . The Ravens shocked even incumbent Billy Cundiff when they elected to have the undrafted Justin Tucker take all the kicks in the third exhibition against the Jaguars. But it shouldn’t be all that surprising: The Ravens are right up against the cap, and sometimes you just have to go younger and cheaper. Oh, and about that miss in the AFC Championship game . . .
Greg A. Bedard can be reached a gbedard@globe.com. Follow him on Twitter @gregabedard. Material from interviews, wire services, other beat writers, and league and team sources was used in this report.